I lov a good, gooy Mac n’ cheese. The warm pasta, the melted cheese, the crunch of breadcrumbs on top. It’s comfort food at its finest. Except when it doesn’t work right. Don’t get me wrong, even not great mac n’ cheese is good, but this batch wasn’t exactly what I was looking for. I’ve always made my Mac n’ cheese with a roux base. The toasted flour gives a great nuttiness to the dish, but while talking to Louise at our local cheese shop she mentioned they had recently switched to a cornstarch version. Apparently it gave a lighter texture to the Mac n’ cheese than the roux bad. So I scoured recipes on line and found a few different versions. 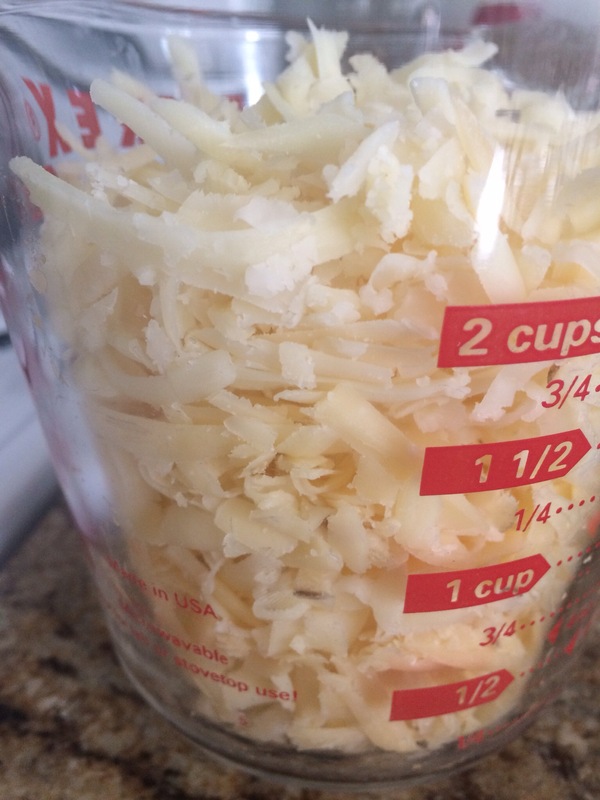 I didn’t pick a recipe to follow, but I did use one aspect of a few of the recipes to try – toss the shredded cheese in cornstarch before adding it to the milk. This should keep the cheese from becoming stringy. 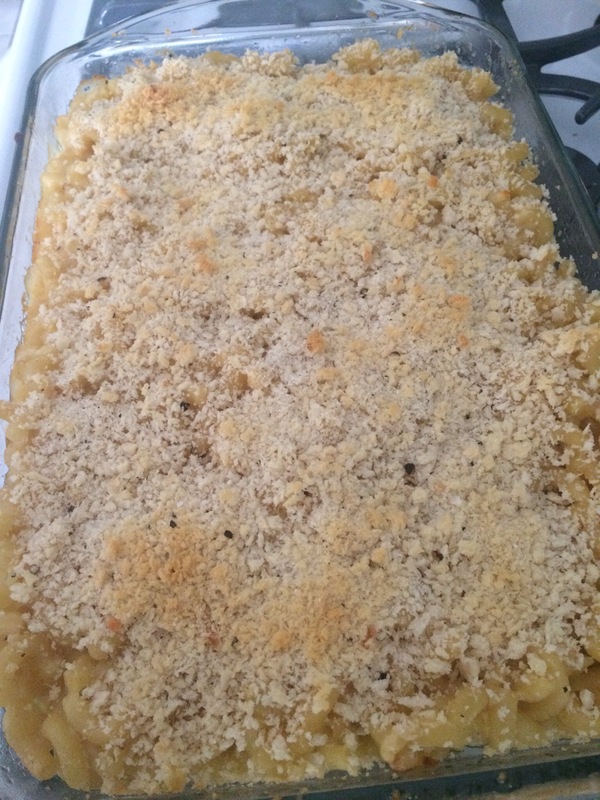 So … One pound of traditional elbow macaroni (Bob’s request), two cups milk, about three cups shredded cheese and some seasonings. Everything looked pretty perfect going into the final stage – baking. Lots of sauce, good flavor and cooked, but not over cooked pasta. I was so excited. But … I needed more sauce. Or to not bake the macaroni. Something. The flavor was fine, but it was like the cheese disappeared. It just soaked into the pasta and the dish didn’t have the creamy oozy consistency you want from comfort food. I’m pretty sure I need to double the sauce – or add another cup of milk and another cup of cheese at the very least. 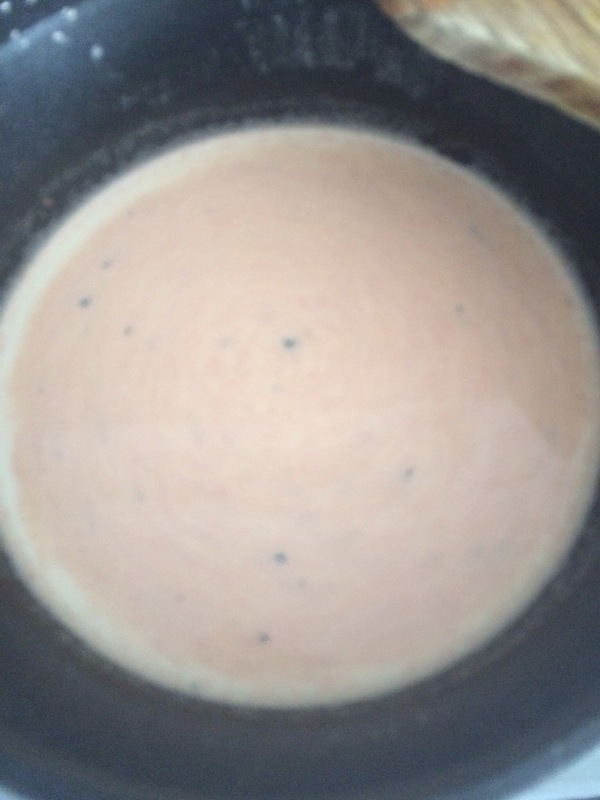 I will go back to the traditional roux version, but will keep the cheese coated in cornstarch. I will probably skip the baking step next time too – I love the crunch the baking gives it, but I would prefer the creamy texture to the crunch. All in all it was pretty good, and I know what to change for next time. I will be the first person to admit that I haven’t been terribally creative in the kitchen lately. I’ve relied on old favorites and our Hello Fresh boxes to feed Bob and I. 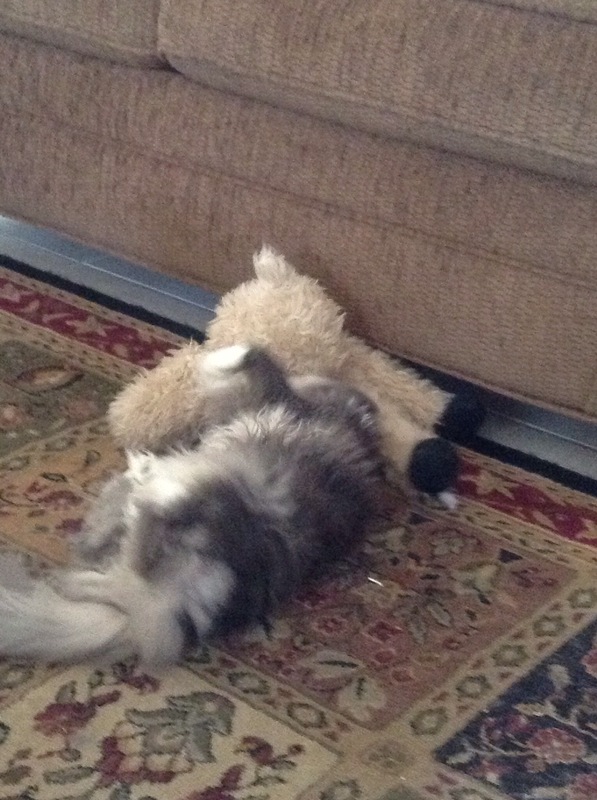 Neither one of us is complaining, but I just haven’t made any thing interesting in a while. This weekend, after a marathon of The Great British Bakeoff (which had its name changed for US television to The Great British Baking Show for some odd reason) and with it finally feeling like fall I found some inspiration. I have a few heavier, comfort food dishes planned for this week, so I decided to start with a lighter salad. But it is fall and that means some of the dark greens, like kale, are in season. 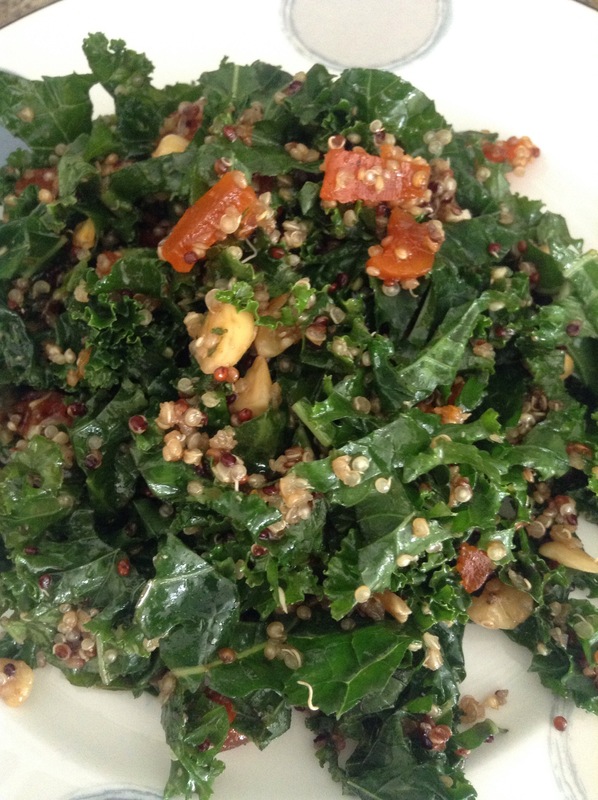 I love the magic kale salad but also wanted something light, but packed with goodness. I also found a quinoa salad that looked good, but not exactly what I wanted. So I decided to take bits from each, combine them and experiment. 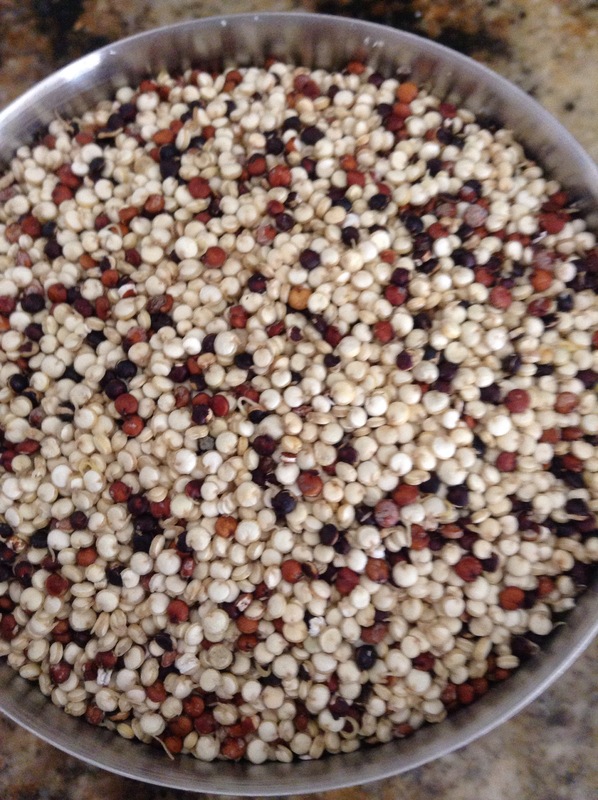 I started with making the quinoa. I used a sprouted rainbow quinoa since I wanted the color and that is what the grocery had. 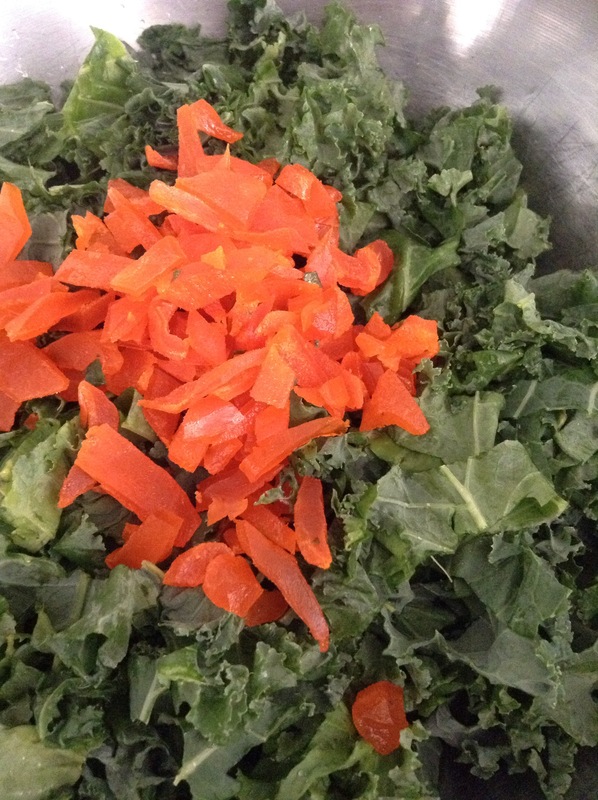 While that was cooking, I cleaned and chopped half a bunch of kale. 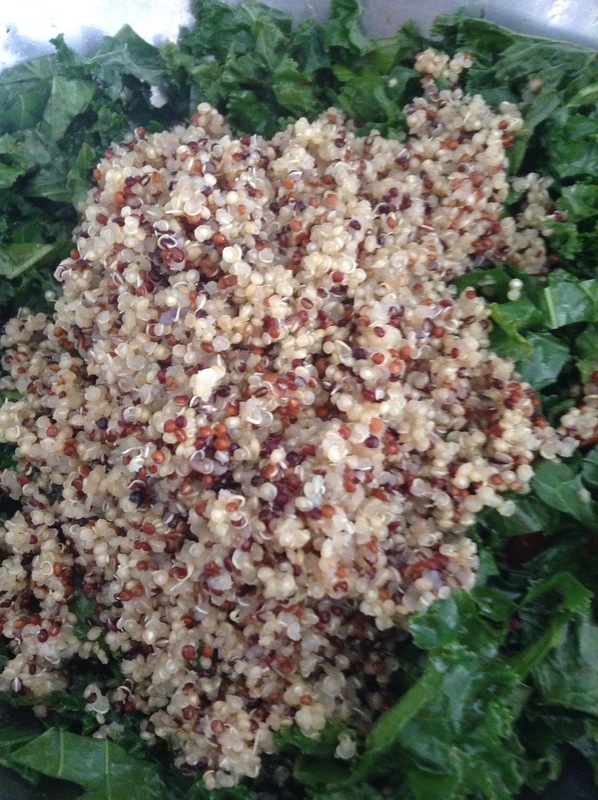 I decided to not go for a full bunch since the quinoa would add some bulk to the salad. From there I chopped up a little bit of dried mango (a small handful total once chopped) and a handful each of walnuts and almonds. For the dressing I use basically the magic make dressing with a few changes – I dropped the balsamic to two tablespoons and added one tablespoon of sherry vinegar. I also used plain rice vinegar instead of seasoned and was generous with the salt and pepper. Once the quinoa was cooked, but still had some liquid in it, I added about a quarter of the dressing to the pot and mixed it in well. I let that finish soaking while I poured the rest of the dressing over the kale mix and tossed. I let that sit for thirty minutes then added about a cup of the quinoa, tossed again and refrigerated for another thirty minutes. No cheese, no lemon, no herbs for this salad. I figured if I needed to add them in later, I could. I loved this result and I didn’t miss the cheese, although I do love the creaminess it gives in the original magic kale salad. The sherry added the right note and the dried mango was a nice change from the cranberries I usually use. A good transition salad for summer to fall. 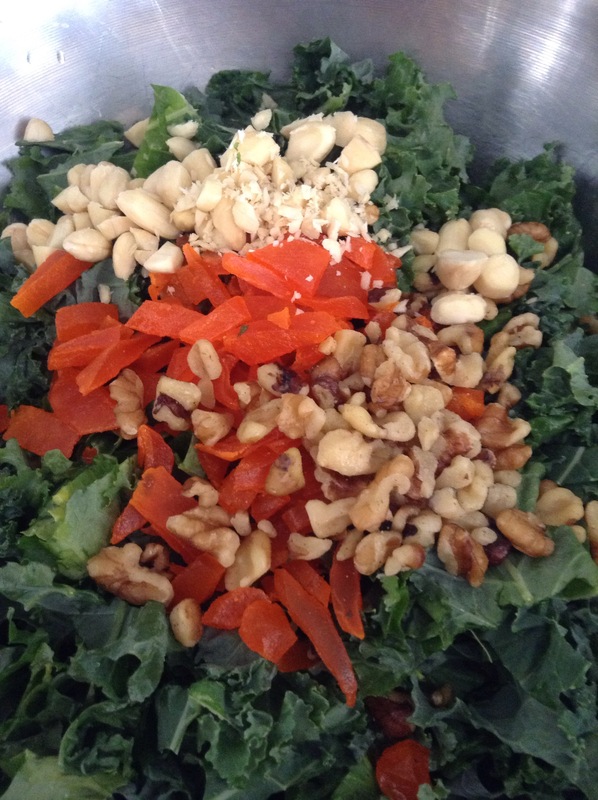 Chopp the kale, dried fruit and nuts. Mix together in a bowl. My the remaining ingredients to make the vinegrette. Once the quinoa comes off the heat, pour in about 1/4 of the vinegrette and mix well. Cover, off heat, until done. Fluff with a fork. Mix the remaining vinegrette in the kale salad and toss to combine. Refrigerate for thirty minutes. Add the quinoa, toss again and refrigerate for another thirty minutes. Serve immediately. It has been a little while since I’ve sat down to post. Life got a bit crazy for a bit, mostly of my own doing, but I think I have it sorted out now. Before the school year started I had applied for a job in Tallahassee – it came across in my email and looked like something that would be a great match. Thinking nothing would come of it, I applied. Turns out, I got an interview, then a second inte view. After that second interview, I knew I would be a little sad no matter what happened. I didn’t get job and it kind of sucked because I know I could do it and it would be challenging and interesting. It’s nice because I like where I am and what I do. What I learned is that I am really knowledgable about my field and can talk with very important people about it. They may have different philosophies and priorities than I do (hence I’m staying where I am right now) but I am perfectly capable of being part of the big picture in education. The question now is, do I want to go for more jobs like that, which would require moving, or just work on saving my little corner of the education world? I haven’t answered that question yet, but, as always, I’ll keep my eyes open and see what is out there. There might be a small change at work too – I may end up teaching an actual history class in addition to my regular duties. Maybe. I haven’t said yes yet, but it would be fun. I just don’t want to burn myself out and spend all of my time at work, so I’m still thinking about it. With all that going on, I haven’t experimented in the kitchen much. 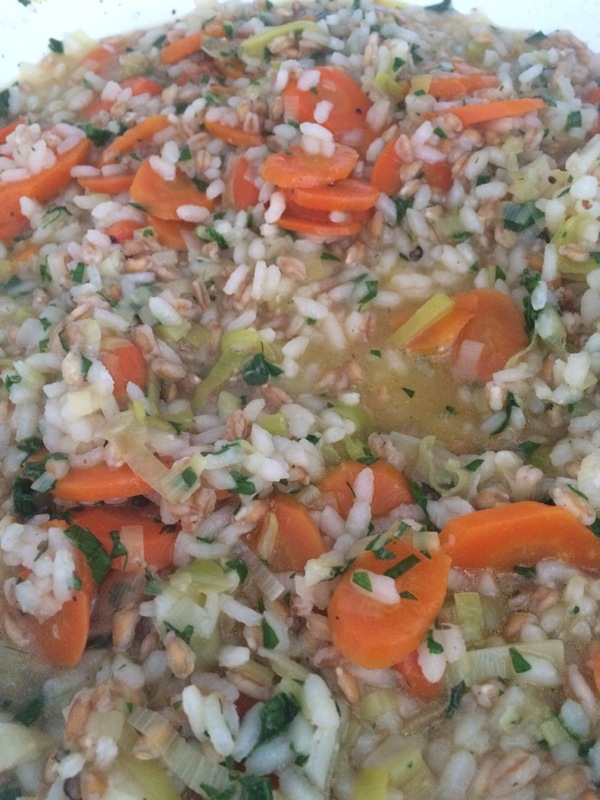 I did make a new risotto this week – leek and carrot. I found the recipe in my NY Times app and simplified it. I cut it in half, use part aborro rice and part farro (I ran out of rice) and used an herbed salt in place of the salt and chopped herbs. 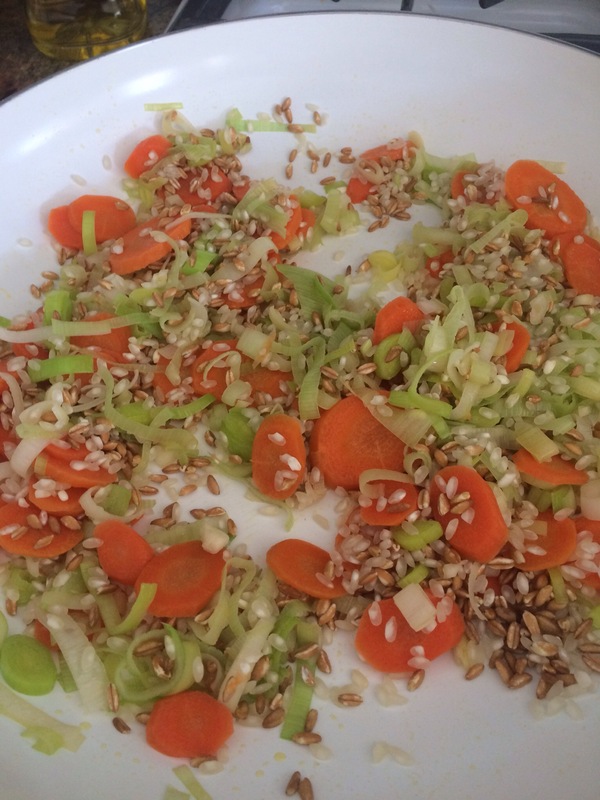 It came out rather well – the carrots have a great sweet taste when cooked and the leeks are nice and mild. I especially like the nutty flavor the farro gives. It’s great for a fall night. Add rice and cook, striking to coat, for a few minutes.